Summary Cloud-based data storage with sync, backup and sharing features. Disclaimer: Verecloud is a partner and reseller of SoftLayer services, including CloudLayer storage. There are many options available for storing data in the cloud, from Amazon S3's barebones approach to very consumer-friendly options like Dropbox, Box.net, SugarSync and more. Just as varied are users' requirements for these services, which can include backup, version control, collaboration, syncing with a local copy and integrating with an existing network. 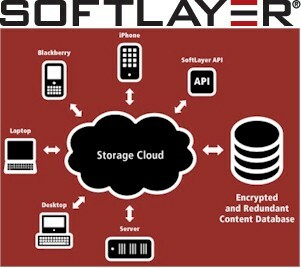 SoftLayer’s CloudLayer Storage has a unique blend of some of these capabilities, primarily targeted toward larger businesses and enterprises. CloudLayer Storage primarily serves as a network attached drive in the cloud, making it ideal for businesses that have Windows or Linux workstations and servers on their network and require a network drive to be accessible outside the corporate firewall. CloudLayer Storage has two basic monthly pricing plans, storage with a la carte bandwidth and storage + bandwidth bundles. The first option starts at 50 GB and the second starts at 20 GB of storage plus 100 GB of bandwidth with both options priced at $10. Storage-only plans actually include 1 GB of download bandwidth and all plans don't charge for inbound (upload) bandwidth. Plans top out at 2 TB of storage ($300) and 2 TB storage / 10 TB bandwidth ($600) before you have to "contact sales" to brew up a custom plan. After creating your account, there are three main ways to access your storage: via web browser; a client for syncing files; and a client for creating a mapped network drive. The CloudLayer Storage Web interface is fairly intuitive and has two main options for uploading files. A common file browser lets you select files to upload, and a Java-based drag-and-drop widget provides an easier way to bulk-transfer files and folders. Within the web interface, you can control access and permissions for other users. Each user is granted access to a Project, which is a logical grouping of files in the CloudLayer Storage space. So if you have multiple files in different folders, you can pick and choose which files are in which Projects, and create the permissions around the Project. Inside each Project are three roles, Managers who can control all aspects of the files and role access, Editors that can edit and change files they are assigned to, and Viewers who can only read the files. All roles can have an expiration date assigned so that permissions are automatically removed after that date. This is a handy feature for time-based projects, providing piece of mind that security can be controlled after a project has been completed. Another handy feature in the web interface is the ability to publish a file to a public URL. When you publish a file, a unique URL is created that allows users outside the CloudLayer Storage permissions to download the file. An example of where this would be helpful is if you have a proposal to share, but you do not want the complexity of adding a user and requiring them to log into the web client. The Publish URL feature can also be deactivated for a file once it is no longer needs to be shared. The Storage Sync client installs on a Windows computer and automatically and incrementally synchronizes selected local files to your CloudLayer Storage. On the surface, this acts like many cloud backup solutions. But the advantage of the Storage Sync is that the files being synced to the cloud can be shared with other users or edited and uploaded by other means, and changes are then synced back to your client. The CloudLayer Storage Client for Windows and Linux lets you map a network drive to your CloudLayer Storage. The client simply requests your credentials when it launches and promptes you select a drive letter. In a few seconds, the new drive letter shows your computer's drive list. You can then browse, upload, or download files just like you would with any network drive. CloudLayer Storage can also be accessed via WebDAV and through native clients that SoftLayer has developed for Windows, BlackBerry, iOS, and Windows Mobile devices. Note that WebDAV and browser are the only methods supported for Mac OS and there is no Android support other than through the web interface. I did not test any of these clients, but there are a few iOS app screenshots in the Gallery. I also did not test the options to connect to CloudLayer Storage over Linux, which include mounting the remote file system or connecting using WebDAV and a command-line client. More details on this type of connection are found in this knowledgebase article. Given my relatively low bandwidth DSL connection, I decided to test CloudLayer Storage's throughput performance using cloud-to-cloud transfers. The goal here was to determine the maximum speed that could be attained without the bandwidth limitations of a typical consumer internet connection. I tested the connection using a Windows Server 2008 instance running on a SoftLayer server, with a mapped drive to CloudLayer Storage. The test server and CloudLayer Storage were on different SoftLayer subnets connected via a 100 Mbps (12.5 MB/s) public IP connection. For upload, I used a drag-and-drop transfer using the CloudLayer Storage web interface. This took over 11 minutes to upload 800 MB or about 1.2 MB/s. For download, I did another drag-and-drop transfer, this time between the CloudLayer Storage mapped drive and the Windows Server 2008 desktop. This transfer took a little over 2.5 minutes, or about 5.3 MB/s. The conclusion is that while the drag-and-drop web interface is convenient, using a mapped drive is the way to go for performance. Support requests are primarily handled via SoftLayer's web-based trouble ticket system. There are also customer forums, knowledgebase articles and a few FAQ pages. But the FAQ pages lean more toward sales than support and are in PDF form. Phone and email support is also available. Information on how Softlayer Storage secures your files is scattered among various pages on SoftLayer's website and various PDF FAQ and datasheet documents. Given the business audience for CloudLayer Storage, it's surprising that this issue isn't addressed in more detail and in one place. The FAQ contains this bullet under What are the advantages of CloudLayer Storage? "Advanced Security Technologies 256-bit AES encryption, SSL encryption, role-based permissions, share expiration, and more protect data during transmission and while stored." and this under Where does CloudLayer Storage store data? "CloudLayer Storage stores all loaded files to an encrypted, redundant database built on SoftLayers proprietary StorageLayer storage environment. This redundant centralized storage array integrates multiple enterprise-class storage technologiesincluding EVault Backup, iSCSI storage, FTP/NAS, and CloudLayer Storageinto a unified solution that leverages SoftLayers peerless automation expertise, geographical diversity, and industry-leading Private Network." CloudLayer Storage is a viable option for file sharing, collaboration, and synchronizing. While it is not as polished as DropBox and Box.net, its more business-focused options may make it a better fit for your business. Poster summary of CloudLayer Storage Fs and Bs. This Windows app keeps local and cloud stores automatically synced. The iPhone app lets you copy these document types in both directions. You can also save photos taken to your CloudLayer Storage account.